It's been almost 17 years since Sammy Davis Junior lost his battle with throat cancer. Before his death, he had mastered just about every form of entertainment: live performance on stage and radio, recording, film and television. But only now are Americans getting to know Sammy Davis Jr. as a photographer. A new coffee table book featuring photos taken by Davis is on sale now. The book, "Photo by Sammy Davis, Jr.", is made up of Davis' photos, but the words are those of his longtime friend, Burt Boyar. 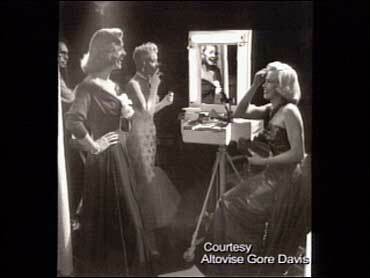 Davis' photos were discovered inadvertently by Boyar while he searched through a warehouse full of Davis' possessions. "We opened up these boxes, crates - some big enough to drive a car into - and they're filled with boxes of negatives, photographs," says Boyar. "Photo by Sammy Davis, Jr." includes shots of many of Davis' famous friends, such as Frank Sinatra, Marilyn Monroe and Elizabeth Taylor, but include more casual images of superstars, political figures and everyday Americans as well. "He packed a camera before he packed anything else," says Boyar. "Eventually, he had more cameras than, I think, camera stores!" Davis helped to document important events during the civil rights movement as well. During the famous "I Have a Dream" speech, Davis was right up front with the reporters and press photographers, taking pictures to capture the speech from his point of view. A lifelong friendship began when Boyar, a former Broadway columnist, first met Davis in the late 1950s while Davis was starring in Mr. Wonderful on Broadway. Later, Boyar and his late wife, Jane, worked with Davis on his bestselling memoir "Yes, I Can", which is currently being made into a documentary.